In a windowless room in Shanghai lit up by gunge-green light, three girls are taking selfies whilst wearing hats made from syringes and shuttlecocks splattered in pink paint. Three headless mannequins dangle from the ceiling nearby. Next to them five black boxes are perched at chest height on poles, each with a peep hole offering access to view mildly disturbing photos of shadowy, Slender Man-esque figures inside. The bizarre array of items comprises the latest art exhibition to open in the high end Reel Mall in Shanghai's central Jingan district. The artworks, in particular a drawing of a sweating spherical Cyclops creature licking a nail, clash somewhat with the endless rows of designer clothes shops and restaurants that fill the rest of the building. All of the artworks, from the shadowy boxes to the syringe hats to the painting of a contorted head with a bunch of bananas on it, were created by either those suffering from mental health problems or artists seeking to address issues relating to such problems. The exhibition, named Journey of Psychotics (the somewhat un-PC title can be forgiven considering that it's a translation from Mandarin), has been put on in an attempt to help shift the Chinese public's often dimly informed views of mentally illness in the country. The works vary in quality but many give touching insights into the struggles of the creators. Curator Cao Xun points to the black boxes and explains, to little surprise, that they were made by a man suffering from depression. The artist has the nickname Shadow and used to be a rollerskating instructor but due to his condition he now doesn't work, spending much of his time crafting his sinister boxes and taking photographs to place inside them. "He seeks perfection," said Cao. "He won't feel satisfied until he has developed each photo about 50 times. He is very seriously depressed." The most impressive works are at the opposite end of the color and mood scale to Shadow's pieces. One wall is adorned with colour-burst paintings made by a woman named Yishu, with many depicting joyous family scenes. Cao explains that Yishu, 32, is institutionalized as she suffers from schizophrenia. She spends up to 12 hours a day painting pictures depicting her young, mental illness-free life. "She started suffering when she failed a college entrance exam and broke up with her boyfriend," said Cao. "You can see them together in a picture: two people lying beside bicycles. She thinks she had the perfect childhood, all these paintings are showing beautiful things. When she got ill she was in a very bad situation. Now she wants to prove so badly that she is capable of having a normal life, but her parents are worried that she would do something wrong if she came out of hospital." There is a whiff of hipster about Cao, who is in his early 30s and has a large leather frog-shaped purse hanging from his neck. He explains that before the theme of the exhibition was decided his curating company considered showing outsider artworks by either beggars or prisoners because they wanted to make an "unprecedented" exhibition to "turn eyes towards marginalized groups." Cao spent seven months garnering artworks, visiting seven hospitals and liaising with NGOs who promote art for the mentally ill, as well as working closely with the relatives of sufferers. "There are distorted notions about this group of people," he said. "They shouldn't be marginalized and estranged. I don't want people to show empathy to them, I'd rather they respected them for their talents." He is addressing a real problem. Public perception of the mentally ill in China is often woefully negative, partly due to a drastically under-resourced treatment system. "The post-1980s generations feel more at peace with them but the older generations are scared," he said. "For example, if my mum knows I spend a lot of time with them she tells me not to hang out with them." Negative perceptions of the mentally ill are often worse in rural areas of China, away from the influence of the increasingly modern liberal leanings of the country's urban youth. One example of the difference in attitudes between rural and urban areas is provided by Wang Shouying, an artist who lives and works in rural Shandong province and was allowed to contribute to the exhibition despite not being diagnosed with any mental illness. Her bizarre mannequin-based works and garish clothes designs cut her out as an eccentric creative, but she pays the rent with a job in a restaurant. "People in Shanghai just treat her as a talented person," said Cao, pointing out that famous Chinese actress and singer Bingbing Fan recently flew Wang to Paris to take part in a fashion show. "But in the rural area where she lives people can't understand her because she doesn't make much money from her work. A lot of people there believe she is mentally ill. The first law in China regarding the rights of those suffering from mental illness was passed in 2013 after a draft period that stretched almost 27 years. One of the cruxes was a rule that required consent from those suffering from mental illness to get inpatient treatment. State media reported that according to the law there should be "no infringement upon the dignity, personal safety or property of mentally ill people." However the law has major shortcomings, according to Human Rights Watch (HRW), which says it fails to close loopholes that mean mentally ill people can still be locked up against their will with no recourse. The length of time the law took to draft was not only an indicator of how much disagreement there was in the area but also of how low a priority treatment for mental illness is in China. "Care for mental disease is marginalized in the already underdeveloped public health sector," says Huang Xuetao, a Shenzhen-based lawyer who released an influential 2010 report on psychiatric incarcerations in China. A 2009 study published in the UK medical journal The Lancet reported there were only 20,000 psychiatrists in China to treat a 173-million strong population of people with a mental illness — 1.5 per 100,000 people, one tenth of the ratio in the United States. Strong stigma about mental illness exists, perpetuating a lack of understanding and mistreatment of sufferers. Horror stories have emerged of people in rural China being treated like animals, locked in cages by their families for years on end. Human rights abuses in Chinese mental health institutions have also been extensively documented by organizations such as HRW and Amnesty International. Still, the law could help start to slowly shift perceptions, along with the growth of the more liberal young Chinese urban generation. Organizers of events and exhibitions such as Journey of Psychotics hope to encourage a gradual attitude change. NGOs offering art opportunities for the mentally ill are on the increase in China. 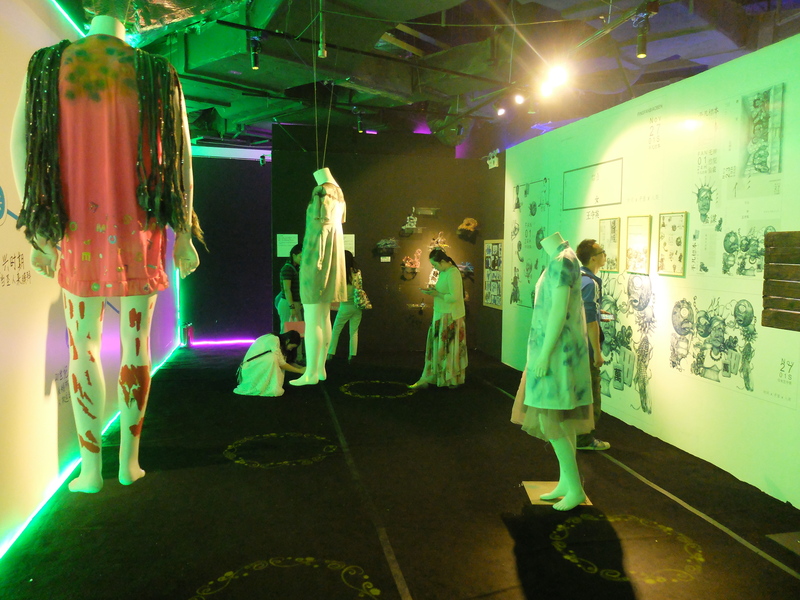 The Nanjing Tiancheng Outsider Art Center, an organization Cao worked with for the Shanghai exhibition, was set up in 2010, offering facilities for the mentally ill to create, exhibit and sell artworks. The organization plans to open three further branches soon. "Our work has received wide recognition and the studio is starting to be copied across China," said Guo Haiping, the center's director. "I believe people's perceptions will change as we increase our efforts,"
"In the past people would help the mentally ill with a mentality of helping the vulnerable," Guo adds. "This actually distanced them from us further. Now we respect and help each other. After spending three months in a hospital in 2006 for a project I realised that most pain for these people came from discrimination and isolation. Discrimination against mentally diseased people is turning to understanding. It's on the rise." Back in the exhibition room, Cao shows off one last exhibit. It's a pile of papers with crudely-drawn colored diagrams on them next to a jumble of innocuous-looking items including a shoe. He explains that the drawings were made by an 11-year-old autistic boy named Justin from Shanghai, who became obsessed with the city's metro system. His parents let him indulge his passion of riding the trains for hours alone, documenting his journeys on paper as he went. Cao picks up the shoe and lifts the sole to reveal a tracking device, then points to a photograph of Justin with a phone number written across the back of his neck. "This is how his parents made sure he didn't get lost," he says. Justin's spidery metro line drawings might not to quite be up to the standard of Yishu's deft, lush paintings, but they represent similar things for both artists. Their obsessions are helping them make sense of their own mental conditions and, being treated with dignity rather than pity in this exhibition, they are making connections with society that would otherwise be out of reach. "The public associates people with mental diseases as being 'nuts'," said Huang. "Fear leads to segregation as the public feels reluctant to know anything about this group. "Change will take time as people get more educated, more mentally disabled people recognize their diseases and discrimination eventually becomes eliminated. A new scene is emerging [with outsider art], it is being pioneered. People suffering from mental illness can express themselves to get out of isolation."